Video and audio tags provide the developer with a rich UI without having to install third-party plug-ins like QuickTime, Flash or Silverlight. This is because these tags are embedded directly into the webpage. This in turn is a big deal because it can save you plenty of development time. Modern browsers like Chrome, Firefox, IE9 (and newcomer IE10) support a multitude of video and audio formats. Plug-in free. You don’t have to worry about users downloading the right plug-in or the complexities in supporting many of them. If you’re unfamiliar with HTML5, before diving into this article you might like to read Yes, You Can Use HTML5 Today! and HTML5 and Even Fancier Forms. The video tag is awesome because it gives you the power to embed video content straight into the webpage without needing a third-party plug-in. To begin with, let’s take a look at the video tag and I’ll explain each attribute. width – sets the width of the video element in pixels. If the width is omitted, the browser will use the default width of the video, if it’s available. height – sets the height of the video element. If the height is omitted, the browser will use the default height of the video, if it’s available. src – sets the video file to be played. For reach, you should supply video formats that are supported by the most popular browsers. poster – sets the image file that will be displayed while the video content is being loaded, or until the user plays the video. If a poster file is omitted, the browser will show the first frame of the video. 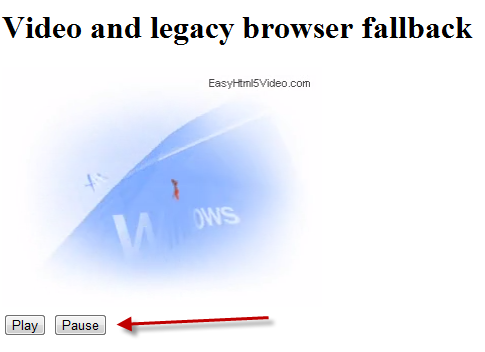 autoplay – instructs the browser to automatically play the video when the page is loaded. controls – displays the video controls to control the video playback. The controls are visible when the user hovers over a video. It’s also possible to tab through the controls. loop – instructs the browser to loop the media playback. autobuffer – used when autoplay is not used. The video is downloaded in the background, so when the user does decide to watch the video, it starts immediately. If the user is using an old browser, for example IE6, 7 or 8, they’ll see this message. 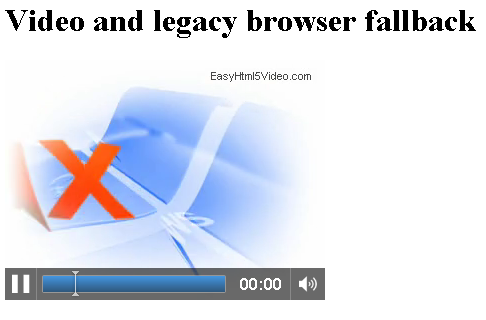 The reason earlier versions of IE display this message is simple: they don’t support the video tag. But what happens if the browser doesn’t support the video you’re trying to play? To work around this issue you simply add multiple video sources. The video tag supports child source elements. Here’s what HTML looks like. By adding multiple sources, the browser will work its way through the list from top to bottom until it finds a video source it can play. Here’s a breakdown of the attributes. type – tells the browser what kind of container format is used. It’s important to note the type attribute. If this is omitted, the browser needs to download a small piece of each file to work out if it’s supported or not. This is a complete waste of bandwidth and totally unnecessary. In the code above we’ve removed the src attribute and replaced it with three source child elements. The main reason for supplying multiple video sources is reach. Not all browsers support the same codecs, so it’s important to create a video file and encode it with the correct codec that your target browser supports. The video element supports play and pause methods, which gives you the ability to programmatically control the video. The following example does just that. Here’s how the webpage will look with the play and pause buttons. This is the best option as it gives the user the power to start the video playback when they decide. You can even turn the volume up or down by using the volume method. Here’s how to do that. A complete list of all the methods and events you can use with the video tag can be found here. Because the HTML 5 specification is unfinished, the video codecs mentioned above may expand or decrease in size. Early drafts of the specification mandated that browsers should have built-in support for multimedia in two codecs; Ogg Vorbis for audio and Ogg Theora for video. The result is that the specification makes no reference to what codecs should be supported by the browser. Google announced they’re open-sourcing a video codec called VP8. IE9 supports this codec if it’s installed. If you’d like to install VP8 for IE9, you can download it here. Like the video tag, the audio tag is fantastic because it gives you the power to embed audio content into the webpage without needing a third-party plug-in. Let’s take a look at the audio tag and I’ll explain each attribute. This content appears if the audio tag or the codec is not supported. muted – sets the default audio output. crossorigin – a CORS settings attribute. If the user is using a modern browser, they’ll hear the audio playing. If the user is using an old browser, for example IE6, 7 or 8, they’ll see the following comments. If the browser supports the audio tag, but not the audio codec, the user will see the following output. To work around these issues you simply add multiple audio sources. The audio tag supports child source elements. Here’s what HTML looks like. By adding multiple sources, the browser will work its way through the list from top to bottom until it finds an audio source it can play. Here’s a breakdown of the attributes. src – sets the audio file to be played. For reach, you should supply audio formats that are supported by the most popular browsers. As with the video tag, it’s important to specify the type attribute. If this is omitted, the browser needs to download a small piece of each file to work out if it’s supported or not. The audio tag will run from the top source until it finds an audio file it can play. And the rounded play and pause buttons can be seen below. This tutorial has been made possible by the support of Microsoft. In cooperation with Microsoft and independently written by SitePoint, we strive to work together to develop the content that’s most useful and relevant to you. It’s important to remember that because the HTML5 specification is a work in progress, the audio codecs mentioned above may expand or decrease over time, but it’s a safe bet MP3 will be there when the specification is finally completed. Malcolm Sheridan is a Microsoft awarded MVP in ASP.NET, ASPInsider, Telerik Insider and a regular presenter at conferences and user groups throughout Australia and New Zealand. Follow him on twitter @malcolmsheridan.